I had to set about answering all of those questions. 1. Microwave the sweet potato (or bake in the oven if you have the time) until soft. Scoop out the insides of the potato, discarding the skin and place into a bowl. Mash with the tablespoon of butter. 2. Heat your waffle maker. 3. In a medium bowl, whisk together the flours, baking powder and salt. 4. In another bowl, whisk together the eggs, milk, brown sugar, lemon zest, vanilla and cinnamon. 5. Stir the sweet potato into the wet ingredients, then fold the wet ingredients into the dry until a batter is formed. 6. Ladle the batter onto the heated waffle maker and cook according to manufacturer directions. To Freeze: Let waffles cool to room temperature before wrapping up and placing in a seal-able bag. To eat, microwave or put in the toaster oven. Thawing not necessary. I changed the recipe a little bit, adding the brown sugar to the mixture instead of using it as a topping on the waffle. I don’t know if it my batter or what, but I needed just a bit more than the 1 cup of milk called for in the recipe. If you batter is too dense, add the additional liquid, a few tablespoons at a time and stir until it gets to the right consistency. 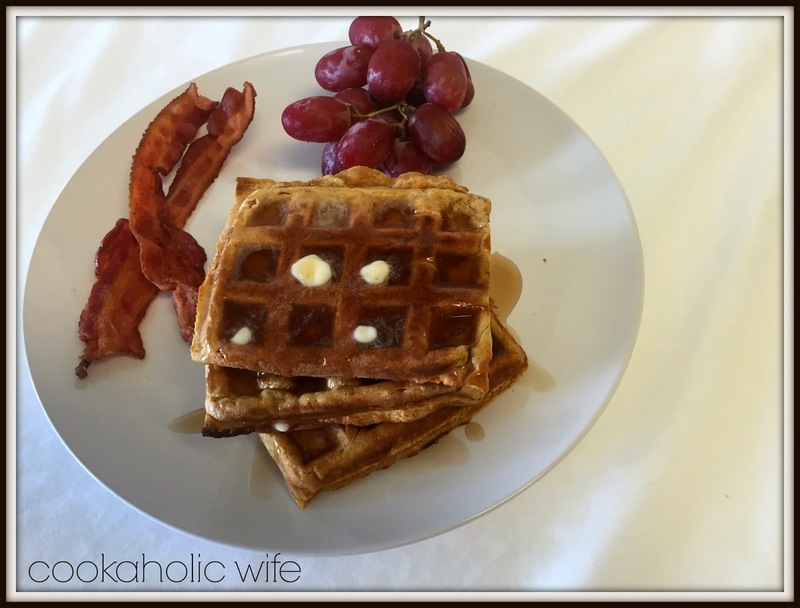 * I use the waffle plates for my Cuisinart Griddler which makes 4 4×3 (approximately) waffles. This batter filled my waffle plates twice. Had I really scooped out the entire bowl I probably could have gotten a 9th waffle from the batter. I did debate on making the paleo version of these waffles (almond/coconut flour, almond/coconut milk, coconut palm sugar) but I thought I’d have a better likelihood of Tom trying it if I used all purpose and whole wheat flour. He is not a fan of coconut or almond flours at all. 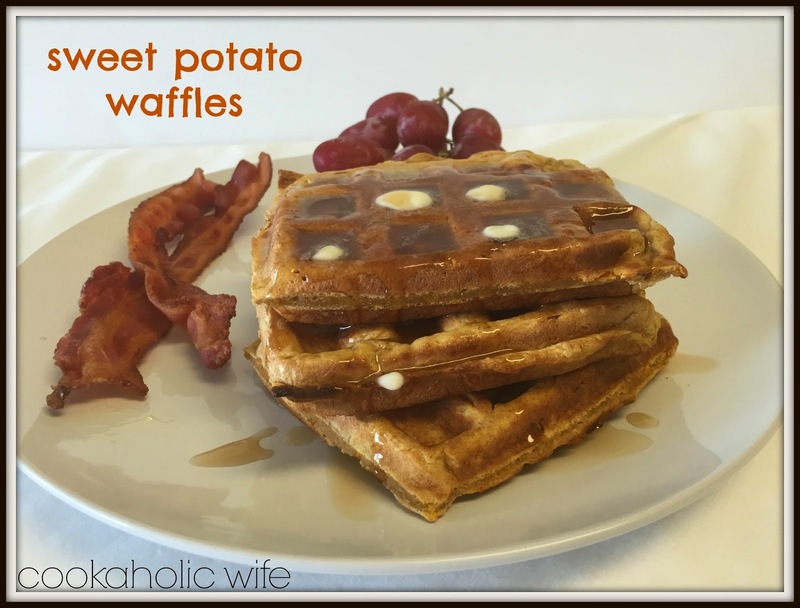 To answer the questions, it didn’t really taste like a sweet potato waffle, but it was obvious it wasn’t your standard waffle as the texture was different and it was much denser. Oh and Tom asked right away if they were sweet potato waffles. I said yes and he continued eating, so win! i'm glad you tried these waffles! we love them! and you are supposed to put brown sugar in the batter so you did that right. i just use additional as a topping sometimes. it's possible you had to add extra milk if you used more sweet potato than i did- i just use 1 1/2 cups which is often less than a large sweet potato as you did. 🙂 fun that we had each other's blogs this month!